Presented by Sts. Vartanantz Armenian Apostolic Church, held at the beautiful Rhodes on the Pawtuxet. For months, the women (and men) of the Sts. Vartanantz Church congregation, work tirelessly cooking and preparing all of the well known Armenian favorites. All are welcome to enjoy delicious homemade Armenian delicacies including Armenian pastries, preserves, and native dishes featuring fresh flame grilled Chicken, Shish Kebab, and Losh Kebab dinners complete with a fresh tossed salad and our signature Rice Pilaf. We also serve our delicious Kufta as a dinner as well. For a lighter meal, we also offer Shish Kebab, Losh Kebab and grilled marinated Chicken sandwiches. For something a little different, you can try one of our zesty Falafel Sandwiches -"Veggie Burger"- made with a delicious seasoned ground chickpea mixture served on a fresh pita wrap with lettuce, cucumbers and tomatoes. For the kids and (those less adventurous), we have Saugy hot dogs available too. Some of our other delicacies include native Yalanchi (stuffed grape leaves), Cheese or Spinach Boreg, Kuftah and Tourshee. Bring your sweet tooth, and sample traditional Armenian pastries including Paklava, Bourma, Choreg, Katah, and the heavenly treat Khadayif. 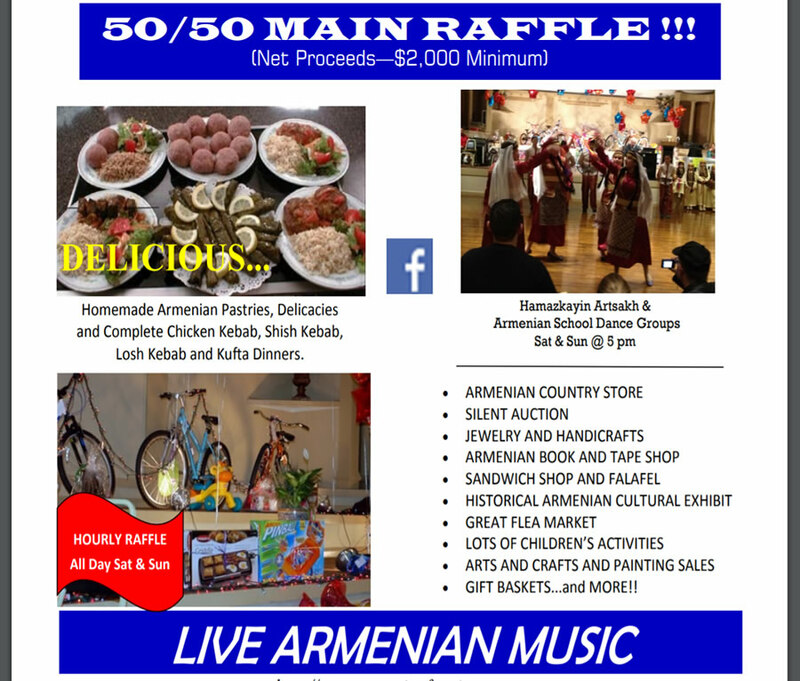 From late afternoon on, enjoy traditional Armenian Live Music and Dancing. On Saturday and Sunday afternoons, enjoy a performance presented by our Children's Armenian Dance Group. Throughout the Festival, you can take a chance on some of the great prizes in our famous Hourly Raffles, or enter our Main Raffle and take a chance on winning $1,500.00 and other cash prizes. We also have a special raffle with $500.00 worth of lottery scratch tickets! We have a full FLEA MARKET on both days as well as Liquor Raffles, Silent Auction, Arts & Crafts for the kids, and our Gift Basket / Boutique Shop! You'll also want to visit upstairs for our Balcony Marketplace, where you'll find many independent vendors with all types of gift items, arts and crafts, Armenian souvenirs, and nick nacks. For a wider selection of Armenian Books, videos and music, visit the Hairenik Bookstore located in the front lobby. We have video games and a kids corner to keep the little ones (and not so little ones) occupied. And finally, a RI Tradition, Frenchy's Popcorn, serving up fresh popcorn, candy apples, cotton candy and refreshing sno-kones. See coupon on right good for a free kiddy bag of popcorn at Frenchy's booth.